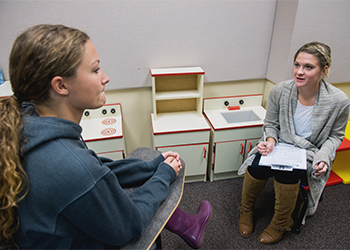 The Department of Speech Pathology and Audiology offers early admission into its M.S. Program in Speech-Language Pathology. Marquette undergraduate students majoring in speech pathology and audiology can apply for this program during their junior year. Students accepted into this program are eligible to enroll in up to 12 credits of Speech Pathology and Audiology (SPPA) course work that carry graduate credit during their senior year. Credits obtained for these courses can be used to fulfill both undergraduate and graduate degree requirements. Once students inform the Graduate School of their completion of undergraduate degree requirements, their admission as a regular degree status (RDS) student in the graduate program is activated. A completed application form submitted online during the fall of your junior year that states you are applying to the summer semester immediately following completion of your undergraduate degree. Official transcripts from all colleges or universities attended except Marquette University. 3 letters of recommendation from individuals familiar with applicant’s academic and clinical work. A personal statement of career interests and goals (maximum 1 page).